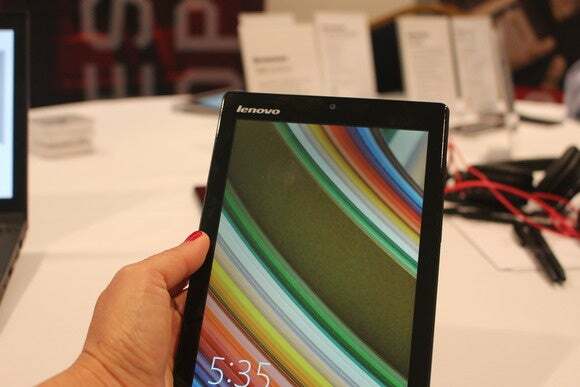 BARCELONA—For Windows users, Mobile World Congress is the place to see the next generation of tablets. Lenovo’s ideapad MIIX 300, starting at $150, gives hope for the future of affordable Windows mobile devices, because it offers a good balance of portability, productivity, and price. And let’s face it: We need more nice Windows tablets. The Surface Pro 3 is too rich for many budgets, but the cheaper $100 Windows tablets tend to have subpar screens and storage. The ideapad MIIX 300 offers some nice perks for the price. Instead of the TN displays you’ll find on many low-cost models, the ideapad MIIX 300 has a 300-nit, 1280x800 HD IPS screen. Some lower-cost models are saddled with inadequate storage, but the ideapad MIIX 300 comes with up to 64GB. While it’s safe to assume the base-price model will have less storage than that, the IPS screen still matters a lot for everyday use. You also get a one-year subscription to Office 365 with the ideapad MIIX 300. Thank Microsoft for that—it’s a popular add-on to the free version of Windows 8.1 (with Bing), which the company decided last summer to offer for tablets with screens no bigger than 9 inches diagonally. This deal helps everyone: Users get their beloved Windows and Office (for a year, anyway), vendors get more flexibility on the selling price, and Microsoft can keep more people on Windows instead of driving them to free alternatives like Android. I just like the idea that I can be productive on a device that’s a lot easier to lug around than my laptop. Nothing against my main work machine, but it’s not as light as the ideapad MIIX 300 (0.8 pounds). It also doesn’t have the MIIX 300’s claimed 7-hour battery life, which the tablet achieves using an Intel Bay Trail Atom quad-core CPU. All I need is a Bluetooth keyboard (the ideapad MIIX 300 has Bluetooth, plus 802.11b/g/n Wi-Fi), and I could leave my laptop at the office for many meetings and quick trips. You could spend more and get more—at the $200 level, you have nice options like Dell’s Venue 8 Pro 3000. When it goes on sale in July, Lenovo’s ideapad MIIX 300 will give budget users a good option at the lower end, and it'll gives busy Windows users like me a laptop alternative for hectic days.